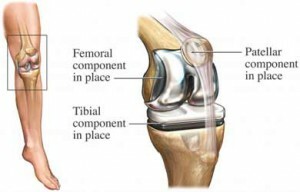 Total Knee Replacement (TKR), also referred to as Total Knee Arthroplasty (TKA), is a surgical procedure where worn, diseased, or damaged surfaces of a knee joint are removed and replaced with artificial surfaces. It is a common surgical procedure most often performed to relieve the pain and disability from degenerative arthritis, meniscus tears, osteoarthritis, cartilage defects, and ligament tears. The most common cause for knee pain which needs Knee Replacement Surgery is osteoarthritis. In Total Knee Replacement, the surgeon removes damaged cartilage and bone from the surface of your knee joint and replaces them with a prosthesis/implant of metal and plastic. Total knee replacement can help put an end to arthritic pain in your knee and enable you to resume a functional and active lifestyle. 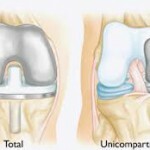 Most people are aware of the total knee replacement surgery. This involves replacing the unhealthy surface of the entire knee joint with metal and plastic implants. It is a very successful operation with good long term results. However a large percentage of patients have arthritis limited to one part of the joint alone. Replacing the whole joint in these patients is overkill and unnecessary. Many middle aged men and women develop osteoarthritis of the knee. Osteoarthritis of the knee affects the inner half or medial compartment to start with and then proceeds to affect the outer half or lateral compartment. In this operation only that part of the knee, which is unhealthy, is replaced. The normal surfaces are left alone. This operation has several advantages over total knee replacement surgery like small incision, longer life of implant and post operative hospitalization is reduced and return to normal is much faster than total knee replacement surgery. A simultaneous procedure means that both knees are replaced at the same surgery, in one day. The benefit of simultaneous knee replacement is that both problems are taken care of at one time. 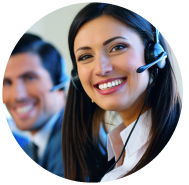 The overall stay and rehabilitation can be done in a shorter time, and there is only one hospitalization. Patients also only require one anaesthesia. 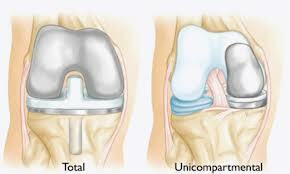 Total Knee Replacements that need to be revised after 15-20 years (post primary surgery) are also done here. The most advanced prosthesis and Computer Assisted Surgery (CAS) is also used for Revision Knee Replacements. Why India has become the ultimate destination for thousands of people across the world who are seeking highest quality knee surgery? Top Class Doctors, some of whom have an experience of performing more than 10000 joint replacement surgeries.